Golfers who retire overseas to sunny, good-value locales can indulge their favorite hobby year-round and pay much less than they would in the States. In a new report, the editors at InternationalLiving.com explore five great retirement spots around the world where the golfing is top-notch. “A much-cited advantage—and joy—of retirement is being able to spend your days as you see fit, indulging in your favorite passions, such as golf,” says International Living’s Executive Editor Jennifer Stevens. “That can prove to be a prohibitively expensive pastime in North America, but in the right places overseas, you can play a round for a fraction of the price back home. International Living’s report delves into five locales for a great golfing retirement—Costa Rica, Portugal, Thailand, Mexico, and Ireland—each offering a different appeal. Costa Rica draws tourists from around the world who come to enjoy its golden-sand beaches, rainforests teeming with exotic life, and intoxicating culture. And, as the winner of the Global Retirement Index 2018, it draws plenty of expats seeking a better retirement and the laidback Pura Vida lifestyle. But if you’re a keen golfer, there’s another reason to enjoy this Central American paradise. 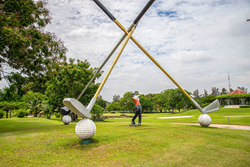 Costa Rica is an ideal spot for both the novice and advanced golfer. Not only are the conditions of the courses exceptional, but—compared to prices in the States—golf here is a bargain. Most green fees are well under $100, and if you live here, the rates can be even cheaper. As one of Europe's best golfing destinations, Vilamoura offers a host of championship courses—the perfect spot for an enthusiastic golfer. There are six challenging courses in the Vilamoura Resort area, including the championship Victoria Golf Course, the Millennium Golf Course, the Pinhal Golf Course, and the Laguna Golf Course. With more than 250 courses scattered throughout Thailand, it has fast become a golfer’s heaven. In fact, Thailand is riding high on the back of a golf-tourism explosion—a major boon for the country. The resort city of Hua Hin, set on the Gulf of Thailand, has been a summer refuge for Thai kings and aristocracy since the 1920s. It’s the country’s original beach getaway. But these days it’s a popular golfing area, too, with a huge selection of courses including the first-ever 18-hole course in Asia. Due to the competitive green fees, every golfer can enjoy the quality golf on offer. Black Mountain Hua Hin is a championship course considered one of the most challenging in the country. It has won copious accolades and caters to players of all levels. The course is located just a few miles away from the center of Hua Hin. The major towns in this area—where the golf courses are located—include Cancún, Playa del Carmen, Akumal, Puerto Aventuras, Puerto Morelos, and Tulum. It’s about an hour and 20 minutes’ drive from the international airport in Cancún to Tulum, with all those other towns in between. So, wherever you happen to live you can easily reach any of the golf courses. A monthly budget for a couple in Cancún runs at $2,000 per month. Lists of the top places to play golf consistently rank courses in Ireland among the world’s best. Home to 300 golf courses, it’s not surprising Ireland has many famous golfers such as Rory McIlroy, Padraig Harrington, and Paul McGinley.